« Red Lion Place, Redcar? 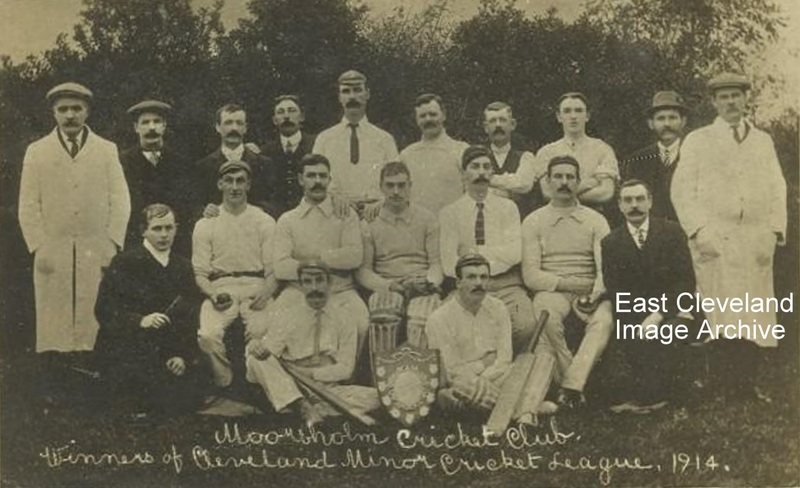 Pictured having won the Cleveland Minor Cricket League in 1914, Moorsholm Cricket Club. Back row: Jordan Jackson, Richard Stevenson, Harry Johnson, William Wren, Tom Shaw, Will Hodgson, Tom Clark, Harry Armstrong, Robert Holliday, George Dove. Middle row: Jimmy Brown, Page Ward, Albion Smith, Arthur Barker, William Catron, Jack Popplewell, Jack Hodgson. Front row: Mr. Greenwood, ??. This image (from a postcard) came to the Archive without names, following enquiries and directing to Keith Harding there was success!! We will probably featuring further images of Moorsholm Cricket Club following a kind invitation. Can anybody assist with the missing name? Image courtesy of Geoff Kitching and thanks to Keith Harding (Moorsholm Cricket Club) for the names. Jordan Jackson the umpire is my grandad; my dad Les Jackson also played cricket for Moorsholm. My great grandmother was Ada Hodgson – the 2 Hodgsons on here are almost certainly her brothers. Thank you for this. Now that names have been put to this photograph that I submitted, I notice that my father’s uncle Albion Smith appears in it which would explain how our family came by this photograph.